Dr. Kevin Leman is a "Love and Logic friendly" author whose new book has a chapter for each of 5 days in the week and a fun day. I thought we'd look at that on this blog for the next week or so. Sampson Publishing is coming out with the course kit Feb. 15. "Your Kids have a game plan to drive you bonkers... but you don't have to let them call the shots." Kevin Leman says kids today are part of "the entitlement group" expecting everything good to come their way with no effort on their part just becasue they exist. Somehow... we've been unintentionally but effectively raising a generation of kids who think the world owes them. How did we do that? We "snowplow our childs road in life- making far too many decisions for her, giving far too mny choices, letting them off the hook or making excuses when he's irresponsible ignoring the little and big ways she disses us." Parents are trying hard but they are worn down and beaten up by constant battling. 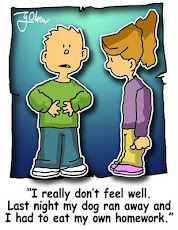 The good news is this... when we (parents) change our behavior, we can change our child's behavior. It might even be fun! 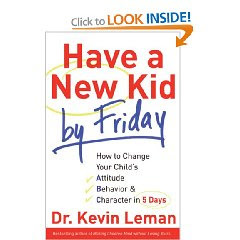 Remember that backbone I talked about a few posts ago... well Dr. Leman says having one is they key to bcoming the kind of parent you want to be and he asks for one week, a Leman 5 Day challenge, to change your thinking and actions. Love and Logic friendly sample : "When your child yells, "you can't make me do it!" he's right. You can't MAKE him do something.. But if he chooses not to be helpful, you don't have to take him to the Secretary of state for his driver's license either." (Love and Logic says "Don't tell a child what they must do, tell them what you will do."